How to undelete and recover files? Click the "Drive" icon in the left navigation pane to choose the drive where deleted files were. Then press "OK" button. 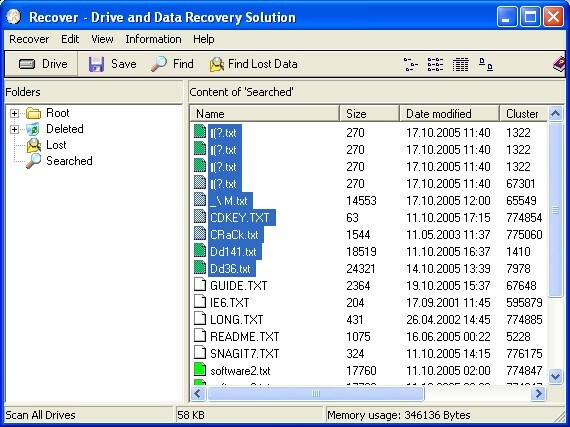 In order to locate deleted files/directories more easily on your hard disk, the Folder List is divided into four categories: Root, Deleted, Lost and Searched. The currently selected category is colored blue. Each of the categories normally contains a number of folders. The Folder List is as simple and convenient as Windows Explorer; it closely correlates with the File List. Selecting any folder in the Folder List displays its contents (files and folders) in the File List. How to find deleted or damaged files? Click on the toolbar or select "Recover" -> "Find..." from the menu (alternatively, you can press the "CTR+F" key on the keyboard). After the search is completed, the found files appear in the Searched category of the Folder List. 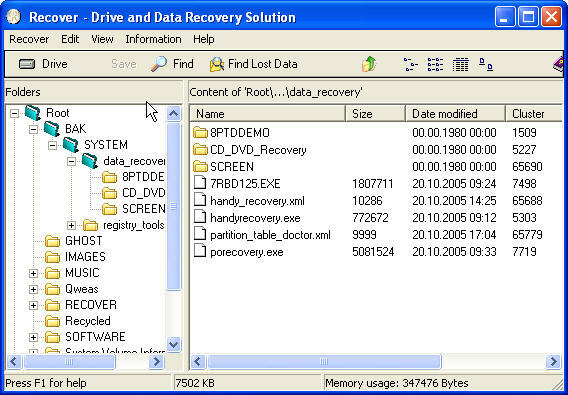 How to recover deleted or damaged files? Select the files you want to restore, then click the "Save" button to choose a output folder and click OK. If you follow the Buy link on the online registration page, it is always safe and secure using 128bit SSL Encryption. What is the easiest way to register Recover? Online, with a credit card, at Purchase page. See the Purchasing Information help topic for more information.